Shotcrete and Vertical Stamped Concrete Solutions. You have probably noticed the beauty and uniqueness that stamped concrete can bring to concrete floors, sidewalks, driveways, and other horizontal surfaces. Have you ever thought about using this same process on vertical surfaces or to create extraordinary landscape designs? Luckily we have, and we are ready to explore the thoughts of the beauty that we can bring to the walls of your home or office buildings, fireplaces, retaining walls, outdoor kitchen man caves, and even create faux rocks for your landscape and pool areas. 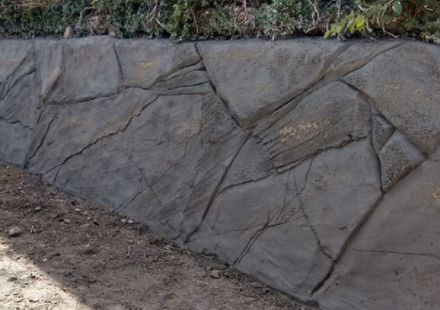 There are many different techniques of created faux rockscapes and vertical stamping, and we prefer the shotcrete method most of the time. Shotcrete is great for both large-scale jobs as well as smaller jobs. This method creates a great amount of stability within the vertical surfaces, as it goes on fast, strong, and with fewer air pockets to deal with. Shotcrete is also great when creating surfaces that require a transition from one texture or finish to another. Shotcrete is pneumatically applied concrete or mortar and can be used as both a wet-mix or dry-mix process. We use the wet-mix process where the concrete mix is pumped through a hose to a nozzle where high-pressured air shoots this concrete mix onto a vertical surface. There are other factors we need to consider when performing this process, and it may vary slightly depending on each job that we are doing. These factors include things like the size of aggregate to use, the weather, the surface type (vertical, flat, sloped, inverted), the distance from the pump to the work location, the size of the crew doing the job, etc. But never fear we take all of this into consideration prior to starting any job so that we can guarantee success in creating an awesome looking product. When it comes to creating faux rocks it takes the right equipment, experience, some artistic ability, but the main three ingredients are the frame, structure, and correct texture. You need to know the purpose of the structure you are creating, as this will provide you with the overall shape, and strength of the frame. For instance, will the rock be used only for visual aesthetics where people will not be climbing on them? Will they be used as a functional piece of your landscaping for people to sit on, climb on, or even be used as stairs? Will the structure be used as a retaining wall or the outer wall of your new outdoor kitchen man cave? No matter what the rocks will be used for, creating the proper frame is vital to the overall success of the finished product. Now that we know what the structure will be used for, and have the proper frame created it is time to call in the most important person on the team and this is the person working the hose and nozzle. The shotcrete needs to be applied at the correct depth, and this takes practice to get the right amount of experience to do the job correctly the first time. Depending on the project, we will come in with two different coats of shotcrete, the first one is the structured coat, followed by a texture coat. The structured coat is just as it sounds. It is applied to be the strong base that forms to the frame giving the faux rock the solid structure to withstand the types of traffic it is designed for. It will also allow stability for the texture coat to be applied and stamped or carved to create the correct texture without compromising the structure itself. The texture coat is applied on top of the structured coat and once applied will be carved or stamped to form the ideal look of the structure you are creating. This does take some artistic ability along with the correct tools and experience to make these fake rocks look as natural as possible. 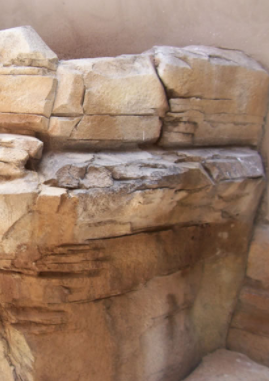 Once the artificial rocks have been created it is now time to come in with the proper stains, coloring, and texture followed by adding detail to make them look realistic. Depending on the project we may use different acid stains, acrylic washes, or oxide washes to create an earth-tone natural-looking rock. If the rocks are going to be viewed from afar, the detail does not have to be as specific, but if the rocks are close enough to touch then the texturing and coloring must be very precise to make them look very realistic. Protecting your investment is always recommended, and sealing the final product will ensure that your shotcrete structure will look great for many years to come. As with any stained surface, we will fully seal and protect the product, and advise you on how to maintain the surface going forward. As always we would love to help you maintain the structures going forward so you never have to worry about any of the maintenance. If you are not located in one of these cities listed above, we can still help you with your parking lot striping project. Give us a call and we can work out the logistics and give you a quote.